I love the holidays. It’s my favorite time of year–all the fun, parties, friends, family and good food. My roommates and I decided to throw a holiday party and this meant I got to make an appetizer. And what did I turn to? 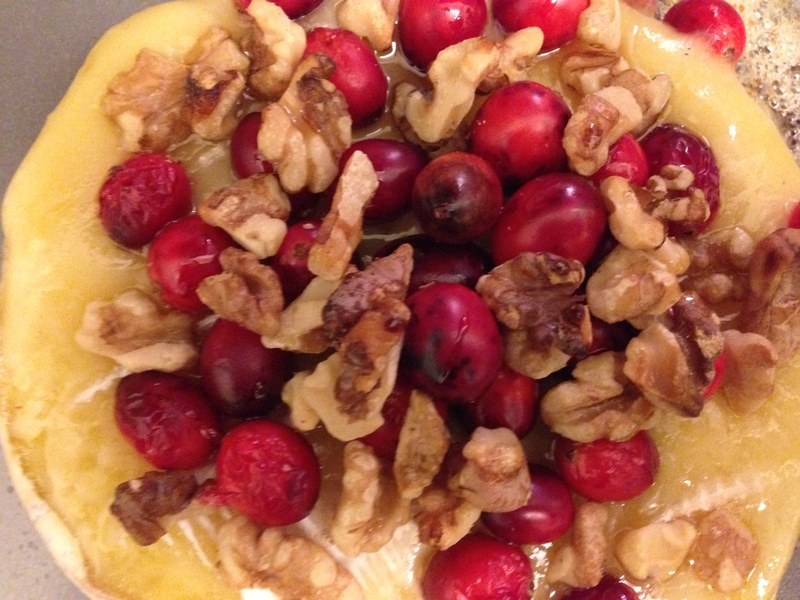 Warm Walnut and Cranberry Brie from Cooking Light. This recipe is insanely delicious. The brie literally melts in your mouth, the walnuts pack a nice crunchy punch, and the cranberry gives the brie a sweet element, all coming together for the perfect savory appetizer. Preheat the oven to 350, remove the top rind of the brie and sprinkle with cranberries and thyme and nuts. Bake for 15 minutes or until the cheese is soft. A simple, easy, healthy, and not to mention delicious appetizer. I served the brie with a baguette and crackers but it’s one of those foods that’s great on its own. It was gone within minutes and I could certainly see why. This brie is a party pleaser and a must try if you haven’t already. You can dress it up with different toppings (pistachio and honey is a great combo). But until next time, keep eating! A big Christmas breakfast is a tradition in our household. At first it was Grands cinnamon buns, one year it was monkey bread, another it was crepes, but this year we decided to go all out and dress up our eggs with homemade eggs Benedict and mimosas. Talk about fancy. 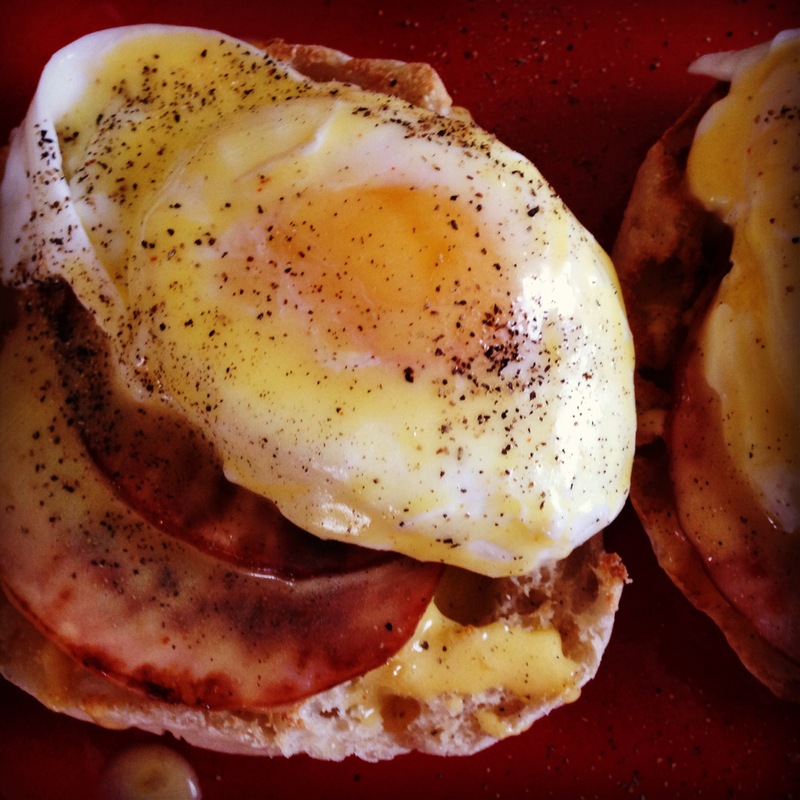 I love eggs Benedict because you can make a slew of different variations but for our first attempt we decided to make basic eggs Benedict–sandwich-sized English muffins, Canadian bacon, poached eggs, and homemade Hollandaise sauce. Whisk the egg yolks and lemon juice together in a stainless steel bowl until the mixture has thickened and double in volume. Then place the bowl over a saucepan with barely simmering water and whisk rapidly (don’t let the eggs get to hot otherwise they will scramble). Slowly add the melted butter and continue to whisk until the sauce has thickened; remove from heat and stir in a pinch of cayenne pepper and salt. To assemble the eggs Benedict, simply toast or broil the English muffins, place 1 (or two) slices of cooked Canadian bacon on top, then a poached egg and finally drizzle with your homemade Hollandaise sauce–simply to die for. If Canadian bacon isn’t your thing, try spinach and cheese for eggs Florentine. There are a ton of different options. This made for a special and unforgettable Christmas morning breakfast and needless to say it will become a tradition. If not for a holiday, Eggs Benedict makes for a perfect Sunday brunch. Test this out, you won’t be disappointed. But until next time, keep eating!